I’ve mentioned before that I’m a big fan of WAHMs (working-at-home-moms). As a mother myself, I enjoy supporting other moms, and as an American, I do prefer to buy American-made if possible. When I came across The Bumtique, Angela was testing out a new diaper pattern, based on customer feedback. I purchased a “tester” diaper. If you’re not familiar with “testers,” diaper manufacturers will often sell a new design (a tester) at a discount in exchange for the customer’s honest assessments. This is a great way to try new brands. Angela started sewing cloth diapers for her second child after deciding to live more healthy and more frugally. She quit smoking after 15 years, and sewing diapers became an outlet for her anxiety and stress. For my tester, I received a one-size pocket diaper with a hidden PUL layer and a tie-dye blue cotton on the outermost layer. The inside layer (against my son’s skin) is made with a 100% polyester stay-dry fabric, to keep moisture off his skin. 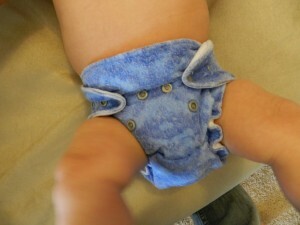 The diaper has snaps on the front of the diaper, allowing the rise to be adjusted to four different settings. 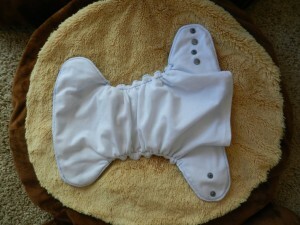 The crossover snaps along the waist can be used to adjust the diaper to fit a very small baby. The size adjustability means this diaper will fit most babies from 10-35 lbs., a great money saver. This diaper did not come with an insert, as Angela was not making them at the time. 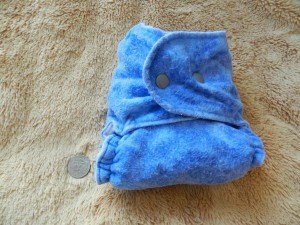 I was able to use microfiber inserts from other pocket diapers in my stash, without any issues. I’ve used this diaper for a couple of months, washing about every other day. It’s holding up without any issues. I haven’t had any issues with staining either. Once I had to sun the diaper for a couple of hours, but the stain sun-bleached out quite easily. I’m also able to get a good fit on my son, both through the waist and the rise. I wish I’d been able to get a good photo of the leg elastic around his legs (he was just too squirmy), but it does fit nicely without gaps. I’ve had no trouble with any kind of leakage either. Baby J still has plenty of room to grow. I wash this diaper with the rest of my stash, and then usually hang it to dry in the sun. I really don’t have any complaints about this diaper. It does the job, and it was a great price. The Bumtique has prints available that, frankly, I haven’t seen elsewhere. Angela’s most popular print is the ’80s “Rainbow Brite” print. She also sells diapers in He-Man, TMNT (Teenage Mutant Ninja Turtles), Transformers, Raggedy Ann & Andy, and a Mario print. She has a Star Wars words print that the sci-fi nerd inside me is absolutely loving! To see a list of available prints, click here. Currently, custom pocket diapers and AI2 diapers retail for $15 at The Bumtique, which is a great price for these nostalgic prints! The Bumtique sells pocket diapers, all-in-two diapers, fitted diapers, newborn-size diapers, and inserts. Babylegs are also available. The store has free shipping every Friday as well as a referral program. Visit here to see a list of discounts and specials. “Like” The Bumtique on Facebook to keep abreast of store stockings, new prints, specials, etc. Note: I was not compensated for this review. The opinions are my own and may differ from that of others.